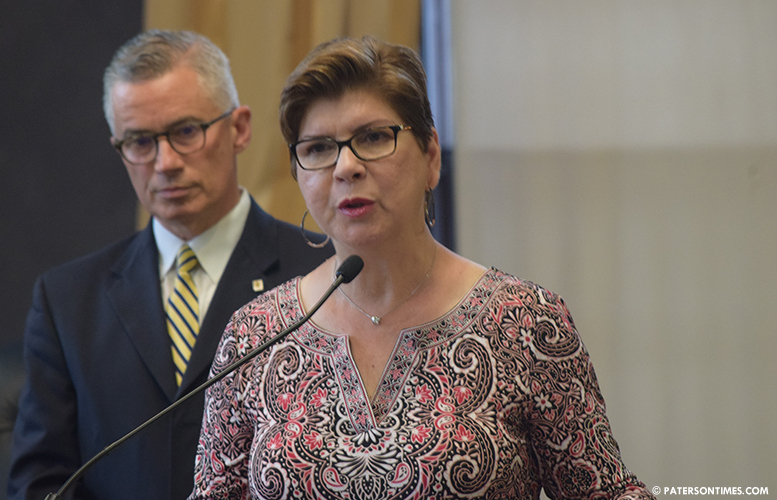 Former business administrator Nellie Pou received $48,716 in severance pay when she departed from municipal government in June, according to public records. Pou cashed out 719.67 hours of leave time — 463.75 sick and 255.92 vacation hours — at $67.69 per hour, according to calculations the city provided last week. Her payment was approved two days before mayor Andre Sayegh’s administration took office. Pou did not respond to a call for comment for this story. Sayegh declined to comment on the severance pay. “One may say this is contractual,” said councilman William McKoy of the 5th Ward. He wanted to see supporting documents showing the accumulation of hours. Her leave hours are governed by what’s called the white-collar supervisors’ contract. Personnel director Debra Hannibal did not respond to questions seeking an explanation on hour accumulation and any limits on carrying over leave time. Pou was terminated last month. She was appointed business administrator by former mayor Jose “Joey” Torres. Her salary was $123,200. She worked in city government for 40 years. Some council members said they were not aware of the payment to Pou. “The council should have been made aware of it,” said McKoy. Flavio Rivera, chairman of the finance committee, said the city needs to put a ceiling on the dollar amount an employee is able to collect by cashing out unused sick and vacation time. He also suggested restrictions on carrying over sick and vacation time at the end of the year. McKoy said the state has to impose the restrictions. Pou wasn’t the only former high-level employee to receive a big severance check. Jane Williams-Warren, former clerk who served as mayor since October of last year, received $40,552 for 92 vacation days, according to a story in the Paterson Press yesterday. Williams-Warren also double dipped. She had promised to voluntarily stop receiving pension payments while earning $119,000 as mayor. She continued to receive her monthly $8,123 pension check while earning a check from the municipal government. She told the news outlet her words that she would pause pension payments was misconstrued. She never corrected her comments which was also reported by other newspapers. Pou is also a state senator. She represents the 35th district, which includes Paterson. Another crooked NJ political hack. Three paychecks, three pensions, no accountability.